David Gunn had just been released from the hospital after trying to kill himself when he met the fallen beauty who changed his life. It was a downtown Albany townhome painted ivory, abandoned years ago but with its elegant bones and tall glass windows intact. Gunn, 30, climbed the wooden stoop and turned the doorknob. The door was unlocked. “Like most abandoned buildings are in Albany,” Gunn noted. The two-story walkup had no electricity or running water. But inside was a wonderland of grace notes: arched doorways, bookcase built-ins, hardwood floors. A huge black A surrounded by an O adorned one wall, the symbol created by 1890s anarchists then made famous by 1970s punk rockers. 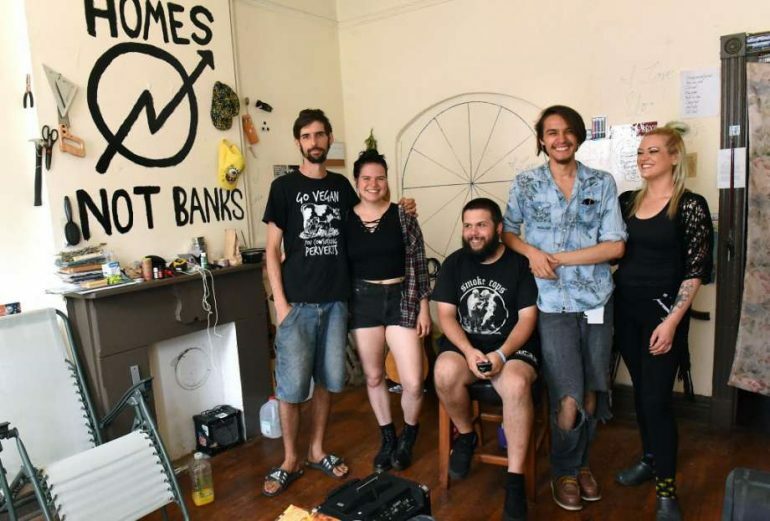 Since 2016, three to eight self-described anarchists have lived here. They have about two dozen Capital Region supporters who are welcome to drop by and plan protests and vigils.